콜럼비아 어린이 대학 병원의 소아 환자들을 위한 아웃리치 콘서트를 개최하였습니다. 디즈니 뮤지컬 노래에 따라 귀여운 소품을 활용하여 더욱 즐겁고 신나는 공연을 선사하였습니다. 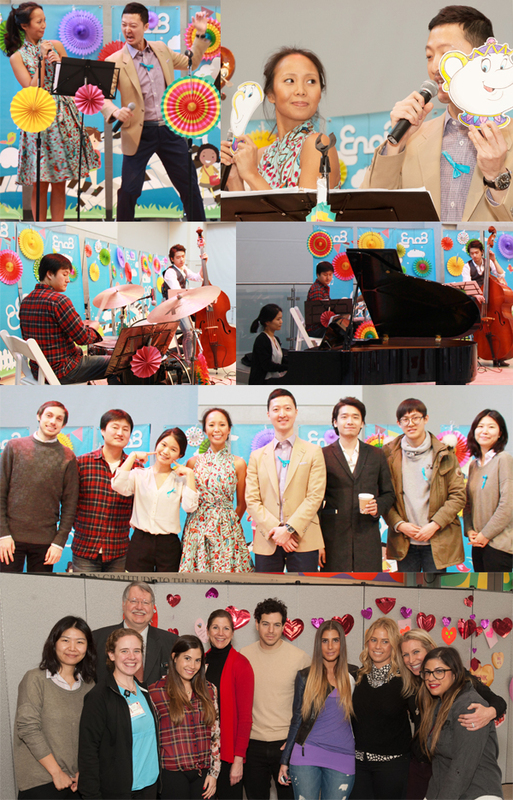 On February 13, we held a concert for children and their families. Musicians performed musical songs from Disney Musicals with cute props. The concerts was great fun! 28일에는 퀸즈의 KCS Corona를 찾아가 어르신들을 위한 클래식 콘서트를 개최하였습니다. 어르신들께 우리가곡과 편안한 클래식 음악을 선사하여 큰 호응을 얻었습니다. 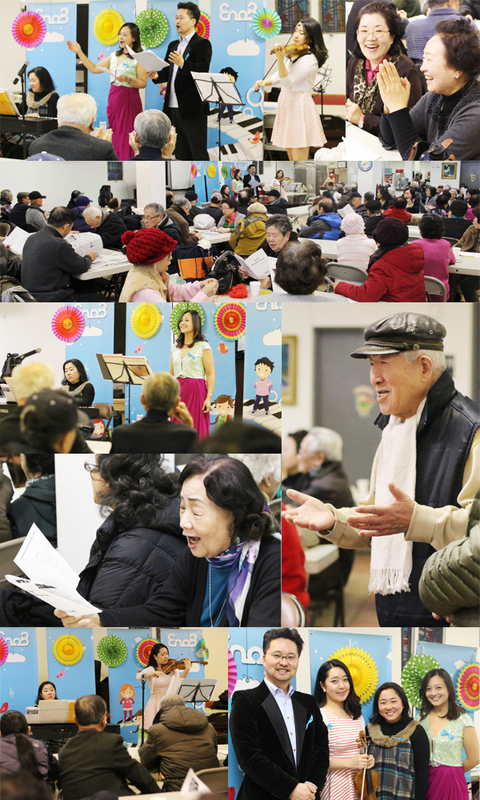 On February 28, we visited KCS Corona at Queens to hold a concert for the elderly and their families. Musicians performed classical music and traditional Korean songs. The concert was enjoyed by all. 최 유경님 - 현재 FIT에서 그래픽 디자인을 전공하고 있는 최유경 인턴은 현재 이노비에서 여러가지 디자인 프로젝트를 맡아 진행 중이며 학교에서는 배울 수 없는 것들을 직접 일하며 배워보고 싶었고, 이노비는 비영리 단체이기 때문에 상업적인 목적을 가진 회사들 보다 디자인의 여러 부분에서 더 도전이 되어 즐겁게 일하고 있다고 합니다. 이준희님 - 이준희님은 대구대학교 통신공학과를 전공하고 있으며, 짧은 겨울 방학기간을 이용해 2월 한 달간 이노비에서 인턴쉽을 하고 있습니다. 곧 한국에서 취업준비를 시작해야 하는데, 짧은 시간이었지만, 전에는 미쳐 생각하지 못했던 분야에서 봉사하며 뜻 깊은 시간을 가져서 뿌듯하다.” 며 “기회가 되면 한국에서도 이노비에서 계속 봉사를 하고싶다는 바램을 밝혔습니다. Jun Hee Lee - He is majoring in telecommunication engineering and he is pursuing an internship chance at EnoB for one month using short winter vacation. We are told that he feels great about having meaningful time with EnoB which was strange field to him before tough he don’t have enough time to know EnoB thoroughly. He has expressed a desire to volunteer in EnoB’s Seoul branch if he get a chance. Gil Su Kim - He starts an internship hoping experience real social work and NPO. He applied for EnoB without hesitation since it's way of approach to people is impressive to him in terms of that they uses a factor of fun such as performance. He told us that he wants to make a dim concept of social work into materializing through this field experience. 뉴욕 FIT의 한인학생회 KSOF를 소개합니다. 2013년 9월부터 이노비와 협력관계를 맺은 KSOF는 이노비 베네핏 콘서트의 특별전시회에 작품을 출품하여 작품판매 수익금을 이노비에 기부를 하기도 했습니다. KSOF 는 FIT (Fashion Institute of Technology)에 재학중인 한국인 유학생 및 한국교포 학생들의 뉴욕생활 적응, 학업 및 취업 등의 각종 정보교류와 졸업생들과의 관계를 두텁게 다지기 위해 2011년에 만들어진 단체 입니다. 또한 뉴욕의 다른 예술대학교 및 종합대학교들과 다양한 행사들을 준비하고 참여함으로써 뉴욕 한인학생들의 관계발전 및 각종 정보교류에도 힘쓰고 있습니다. 나아가 여러 가지 봉사활동에도 참여함으로써 뉴욕사회에 도움이 되고자 노력하고 있습니다. Since September 2013, EnoB and FIT KSOF(Korean Student Organization of FIT) became cooperative partners. 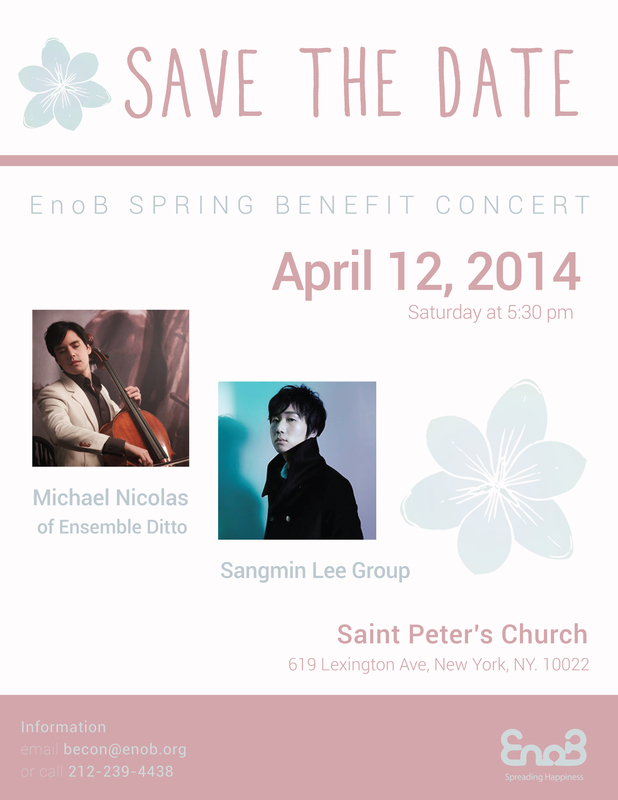 KSOF held an art exhibition during EnoB’s Benefit Concert. KSOF then donated the profits made that evening to EnoB. 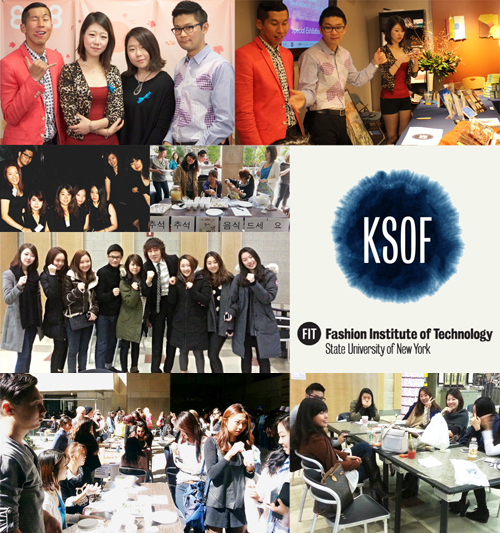 KSOF is a Association of Korean students attending FIT. The association provides opportunities for students to connect to other art schools and universities in the new York region. 뉴욕 공식 비영리 예술연맹기구 KANA를 소개합니다. 이노비의 협력단체인 KANA는 지난 9월 이노비 베네핏 콘서트의 특별전시회에 작품을 출품하고 판매수익금을 기부하여 이노비의 행복 나눔활동에 동참해주었습니다. KANA는 뉴욕시 예술인의 열정을 장려하고 무한 가능성을 가진 젊은 뉴욕 예술가들을 세계적으로 알리는 매개체가 되고자 2012년 3월 창단된 뉴욕시 공식 비영리 예술 연맹 기구입니다. KANA는 뉴욕을 대표하는 다섯 개의 명문 예술학교(SVA, FIT, Pratt, Parsons, CIA)의 한인학생회 임원진이 설립하였으며, 2013년도부터는 Columbia Univ.와 NYU의 예술인들까지 함께하고 있습니다. 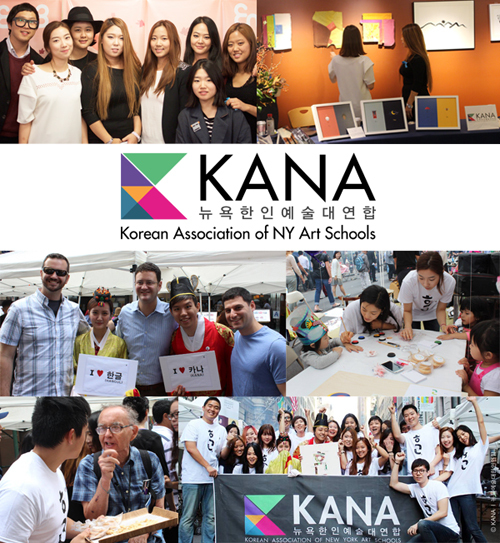 KANA(Korean Association of New York Art schools) is a partner of EnoB. 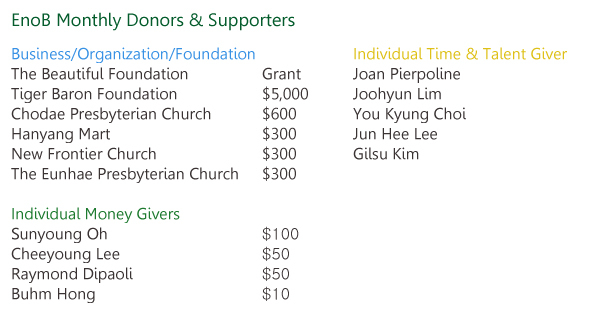 Kana donated the profits of the exhibition they staged at the September Benefit Concert. KANA is an official nonprofit art association founded in March 2012 to encourage young artists to embrace their passion for art and to be a medium for introducing young promising artists who live in New York. It was established by the executive members of the Korean student councils of five prestigious art schools (SVA, IFT, Pratt, Parsons, CIA) in New York. 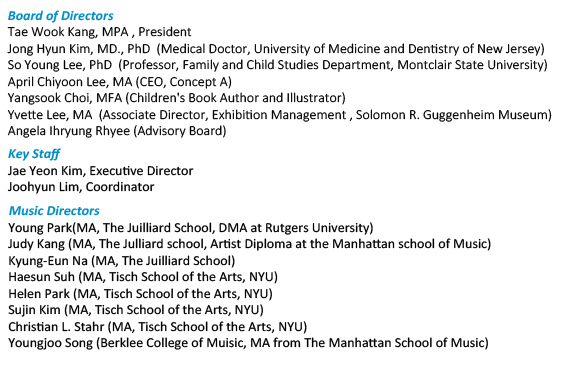 Since 2013, artists from Columbia University and NYU have also joined KANA. Since the exhibition, ‘KANA: the Beginning’ in October 2012, the association is sponsoring a variety of cultural - artistic projects. KANA’s framework includes applied arts, cooking, architecture, fashion, pure fine arts, design, images. KANA also encourages cultural exchange with Korean cultural organizations. 2월 12일, 이노비 서울이 성모병원 호스피스병동의 입원환자분들과 가족들에게 음악선물을 하고 왔습니다. 생의 마지막을 준비하고 계신 환자들에게는 두려움을 잊을수 있도록, 가족들에게는 위로를 드릴 수 있도록 아름다운 클래식을 선물했습니다. 병동 휴게실과 복도, 입원실에 음악이 울려 퍼져 병실에서 나올수 없었던 환자들에게도 이노비의 음악이 전달되었습니다. 끝까지 자리지키며 함께해주신 환자분들과 공연이 끝나고 아쉽다는 말씀 해주신 가족분들, 관계자분들께도 감사드립니다! 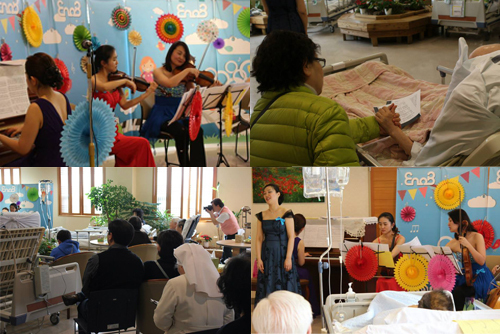 On February 12th, EnoB Seoul held a concert for patients and their families in the hospice of Seoul St. Mary’s Hospital. The music was heard throughout the hospital; the patients who had to stay in their ward were able to listen to the music. We would like to thank all the people in the hospital for enjoying our concert.